Running ahead of us, Fisher the Chesapeake Bay retriever had his picture taken. 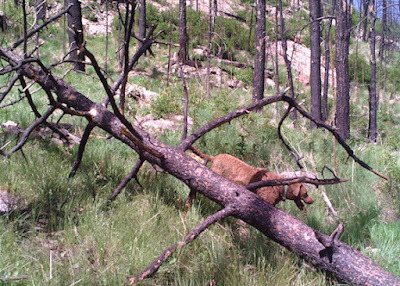 My favorite spot for scout cameras, "Camera Trap Spring," is changing every year. A powerful forest fire went through several years ago, killing the pines and douglas fir and burning all the Gambel oak down to the ground. "Atlas of United States Trees"
by Elbert L. Little, Jr. Wikimedia Commons. After the fire, the Bureau of Land Management paid for aerial reseeding the following spring to prevent flooding and soil erosion — and the weather cooperated. Now there was abundant grass among the blackened tree trunks. Here is how the area looked right after the fire. 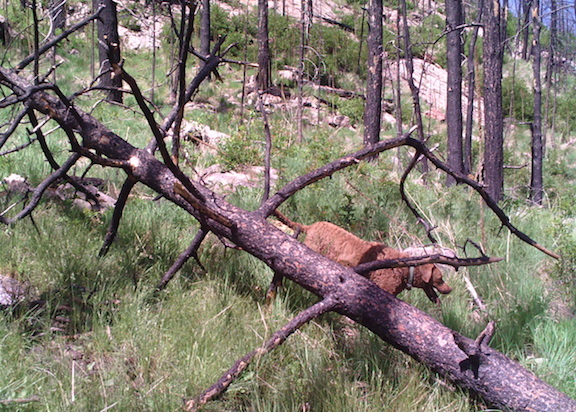 But while entire pine tree root systems were burned underground, Gambel oak survives. Now it is coming back in force. As you can see from the map, southern Colorado and adjacent regions have lots of Gambel oak. The days of easy walking around on the burn are ending. If you look at the slope beyond the dog, you can see that the scrub oak is now about waist-high. Among upright bipeds, turkeys seem to cope better than I do with that stuff. I will post some critter pix soon. Your Summer 2016 Drought Outlook.